Vintage computer collecting for many collectors includes many different types memorabilia in addition to vintage computers. Popular memorabilia include such items as advertising posters, outdoor signs furnished to attract customers, sales counter displays, T-shirts with logo, aids used in programming, original manuals/data sheets, interesting photos, counter displays, magazines, news letters, programming aids -- the list does not end. I have mentioned in the past my colleague Dr.
John Titus was very creative designer. One of his many creative designs was an 8080 microprocessor programming aid the "8080 Octal Code Card" slide rule. This was extremely useful aid for programming the 8080 at the assembly level or in pure machine code. This was marketed for a few years in the late 70's & I doubt if many still exist. This is a great collectable memorabilia for computer retro geeks.I show how this is used and give a little demonstration in the video. Update 11-27-15 I still have some of these cards - just contact me if you would like one. One of my reasons for writing about the 8080 slide rule to point out the use of our Bug's. The bugs were part of our "Blacksburg Group" branding effort more than 40 years. I still use them to help identify and connect my present work to the "Blacksburg Group" which I was a part of during its 10 years of operation in the 70's & early 80's. I call this a slide rule because it has a slider inside and by sliding it to the proper position you had all the machine code instructions for the 8080 at in one neat package. Only the geeks that program microcomputers in machine code and being able to program one machine program step at a time really care about this. The origin of how we created these bugs is an interesting story and I will tell about that in a future post. 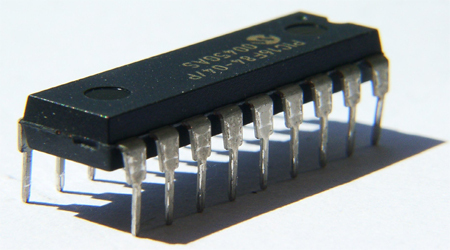 Just a hint - the integrated circuit (IC) chip of the 70's looked somewhat like a real bug. The chip had many connecting pins making it look like a bug with many legs. Most of the designs and writing our group did was about digital electronics and the most digital electronic circuits were contained in these IC chips. We thought it was a unique idea to have some original characture bugs as a branding logo. The first use of the bugs was with Bugbooks I & II just before we formed the "Blacksburg Group. These Bugs were on literally on several million products. The "Blacksburg Continuing Education" books series by itself has more than a million in print. They have been out of print for more than 30 years however you can still go to Amazon and find most available from used book sellers. Many have become collector items - some in new condition are selling for up to $500. Try this - go to amazon.com book section and type in "Blacksburg Continuing Education Series Books" and check it out. I was sure surprised to see the asking price for some of the books in our old series. I guess these books are part of the vintage memorabilia I am writing about in this post. Also notice you will see the Bugs in the upper right hand corner of every book. The bugs are currently owned by my colleague Dr. John Titus and I use them with his permission. Appreciate a like on Museum Facebook Page. People often have a specific image such as "Professor" , "Teacher" "Amateur Radio guy" "Farmer" and in these posting if you had no other reference I would most likely be "The Computer Collector fellow". I want to tell about one other hat I wear is - "Chantilly Farm" Owned by my wife Gaynell and I. This is a 200 acre 'Festival Farm' in the heart of the Blue Ridge Mountains in Floyd County Virginia. Chantilly farm is managed by the LCF Group and our Promotion Manager is Jason Gallimore, Jason books all the great music for Chantilly. We have other good help as well. What do we do at Chantilly Farm? Take a look here www.chantillyfarm.com .